Thompson Memorial Cultural Centre Inc., to give it its formal name, was established in 1974 through the joint initiatives of the Levin Borough Council as it was then and a steering committee of citizens from many societies and clubs. 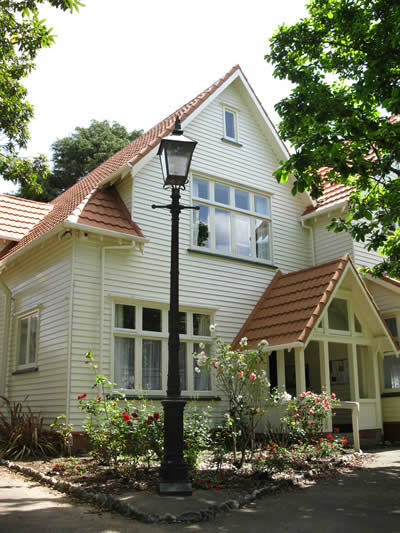 In order to make the best use of a fine building (the former home and surgery of a respected and long serving Doctor, Dr Jim Thompson) the Council presented his house which they had purchased to the people of Levin as a cultural and arts centre. So Thompson House provides the Horowhenua with a unique venue for the presentation of visual and performing arts and crafts, and hobbies groups and meetings including quilt makers, embroidery, lace makers, cake icing, music, book launches, and poetry readings to name but a few. Commercial groups and Government Departments use rooms for meetings and seminars. The Horowhenua District Council remains responsible for the external maintenance and the surrounding grounds, now part of the Levin Remembrance Gardens. The Council maintains a register of Notable Buildings, which includes Thompson House. It is also registered with the New Zealand Historic Places Trust as a building, which merits preservation because of its historical significance and architectural quality (Class C). Inside there are 3 rooms, which can accommodate 12 to 60 people and two Gallery spaces for hire (Up to 50 groups meet regularly). Go to "Hire" for details of sizes and reasonable costs. There is a fully equipped kitchen available at no extra charge. Any member of the public may use Thompson House by joining any of the groups who meet there, or booking a room for a function or meeting. The grounds are a popular place for wedding photos, but we ask that they be booked to avoid overcrowding. The staircase inside the house or power for speakers may be used at a small cost.